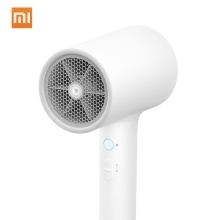 The Xiaomi Mijia Water Ion Hair Dryer adopts ion hair care technology to greatly reduces the scalp discomfort or hair damage, its strong air volume and interesting magnetic nozzle with 360 degree rotation offer best use experience, portable and compact size is so easy to carry, perfect for home or travel use. – Water Ionic Hair Treatment: Designed with an independent water ion channel inside to reduce the interference of high temperature during the diffusion process. – Strong air volume, 2000rpm high-speed motor + 1.6 m3 large air volume with 6 pieces airfoil blades. – NTC smart temperature control, automatically adjusts the time of alternating hot and cold air blowing, and greatly reduces the scalp discomfort or hair damage. – Magnetic nozzle with 360 degree rotation, double-layer structure design can reduce the temperature of the tuyere surface. – Classic and minimalist design style, portable size for easy storage, perfect for home or travel use. 1.Item color may show slight aberration due to different shooting light and monitor display. 2.Product size, product weight, and related specifications are theoretical values only. Actual measurements between individual products may vary.